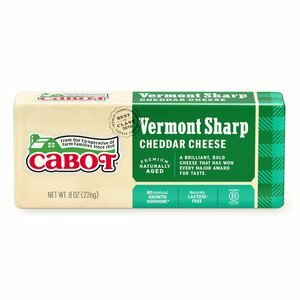 We’re excited to feature this super comforting cheesy corn cheddar recipe from one of the farm families who own Cabot Creamery Co-operative - Barstow’s Longview Farm in Hadley, Massachusetts. 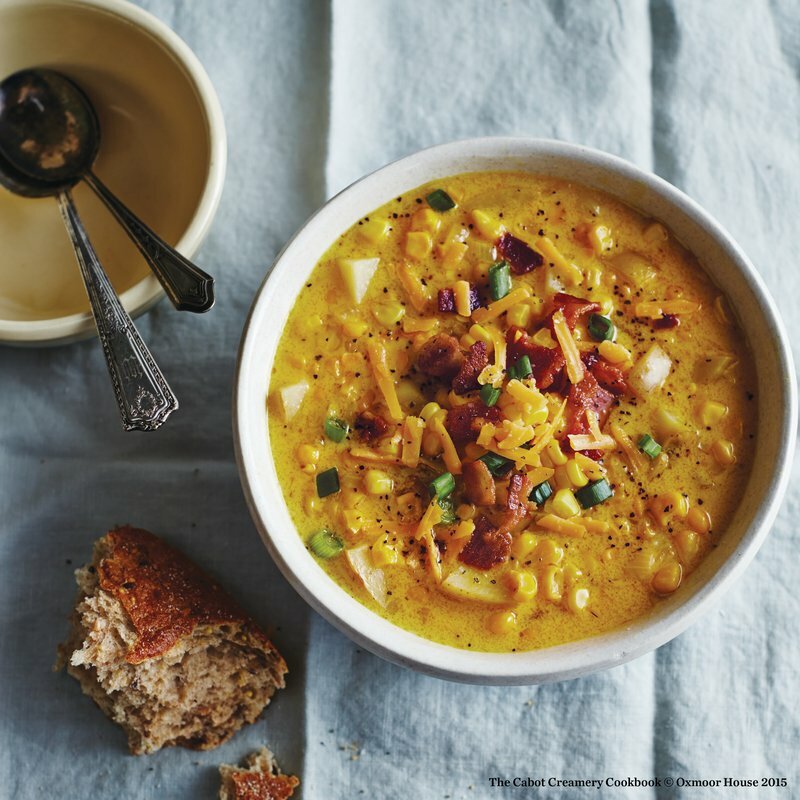 Combining ingredients like corn, white potatoes, bacon, Cabot Sharp Cheddar, onions, chicken stock and half-and-half, this is truly a bowl of comfort. We think you’ll agree! If you do, please share the recipe with friends and family on Facebook, Pinterest, Instagram, and Twitter! To make 8 servings of cheddar corn chowder, begin by cooking chopped bacon slices in a Dutch oven set over medium-high heat, stirring frequently, for about 6 minutes or until bacon is crisp. Remove bacon with a slotted spoon, drain on paper towels and reserve drippings in Dutch oven. Melt Cabot Salted Butter in hot drippings. Add chopped onion, stirring occasionally and cooking until tender, about 8 minutes. Stir in flour, salt, pepper and turmeric and cook, stirring constantly for about 3 minutes. Stir in chicken stock and diced, unpeeled white potato. Bring to a boil, then cover and reduce heat and simmer until potato is just tender, for about 18 minutes. Stir in corn, shredded Cabot Salted Butter and half-and-half. Bring to a simmer and cook about 5 minutes or until cheese melts. Be careful not to boil. Season with salt and pepper and then ladle into soup bowls. Top with bacon, shredded cheddar and, if preferred, sliced green onions. Looking for more comfort served in a bowl? You’ll love our Chicken Corn Tortilla Soup! As a co-operative of 800 farm families, our goal is to make the highest quality and best tasting dairy products you’ll find. We’d love for you to rate and review this cheddar corn chowder recipe once you’ve made it! START by cooking chopped bacon slices in a Dutch oven set over medium-high heat, stirring frequently, for about 6 minutes or until bacon is crisp. Remove bacon with a slotted spoon, drain on paper towels and reserve drippings in Dutch oven. STIR in flour, salt, pepper and turmeric and cook, stirring constantly for about 3 minutes. Add chicken stock and diced, unpeeled white potato. Bring to a boil, then cover and reduce heat and simmer until potato is just tender, for about 18 minutes. ADD corn, Cabot shredded Sharp Cheddar and half-and-half. Simmer on low for about 5 minutes or until cheese melts. Be careful not to boil. Recipe courtesy of Barstow’s Longview Farm, Hadley Massachusetts, one of the 1,000 farm families who own Cabot Creamery Co-operative. Fantastic chowder - but I prefer to peel the potatoes. directions indicate sau&#039;teing onion in bacon drippings...where is the onion in the ingredients list??? Green onion is for garnish, is it not? *We thank you for catching the omission. Edited now correctily.